[ Edward Mason Wrench, private medical attendant to the Duke of Devonshire at Chatsworth House. ] Autograph Journals, describing his life and duties at Chatsworth, and including references to Sir Joseph Paxton. [ London and Baslow, Derbyshire. ] 4 June to 31 December 1862; 24 July 1865 to 11 July 1865; 1 January to 22 February 1866. As befits the son of a City of London clergyman, Edward Mason Wrench was a well-educated and well-connected man (being presented to the Prince of Wales in his old age), attributes which enabled him to thrive at Chatsworth. His standing was also enhanced by an eventful army career. Wrench's obituary in the British Medical Journal (27 April 1912), describes how, after service in the Crimea, 'he was transferred to the 4th Lancers, went to Madras with that regiment in the following month, and served with it during the whole of the Indian Mutiny. [ Edward Mason Wrench, an Englishman in New York City in 1881. ] Cyclostyled pamphlet, in facsimile of his handwriting, with illustrations by him, describing in vivid terms for his children a visit to New York. New York. 22 October 1881. 6pp., 12mo. Cyclostyled in purple ink on two loose leaves of 8vo paper (one printed on one side only, and the other on both sides). A facsimile of small handwriting, with five illustrations, including one captioned 'Steamer on the Hudson River' (the others a view of the Brooklyn Bridge from the river, a silhouette of a racing 'sulky' carriage, a steamer, and an ancient statue 'From Cyprus'). In fair condition, lightly-aged, with light rust marks from a paperclip. The second sheet, of four pages, ends abruptly, with a pencil note: 'concluding pages wanted'. The text begins: 'New York. Two from Park Lodge, Baslow [ Derbyshire ], one of them dated both August 1909 and 13 September 1909, and the other 4 October 1911. The third without place or date. Part of a series of cyclostyled documents, in facsimile of Wrench's autograph, for distribution amongst his family. The three items in good condition, lightly aged and worn. ONE: Facsimile letter with facsimile signature 'Ed M Wrench'. Headed 'Aug 1909' and with 'Sep 13 1909' at foot. 3pp., 4to. [Llewellynn Frederick William Jewitt, antiquary.] Autograph Note Signed ('Llewellynn Jewitt') to 'A Williams Esqre', thanking him for a positive review of his 'Half Hours'. 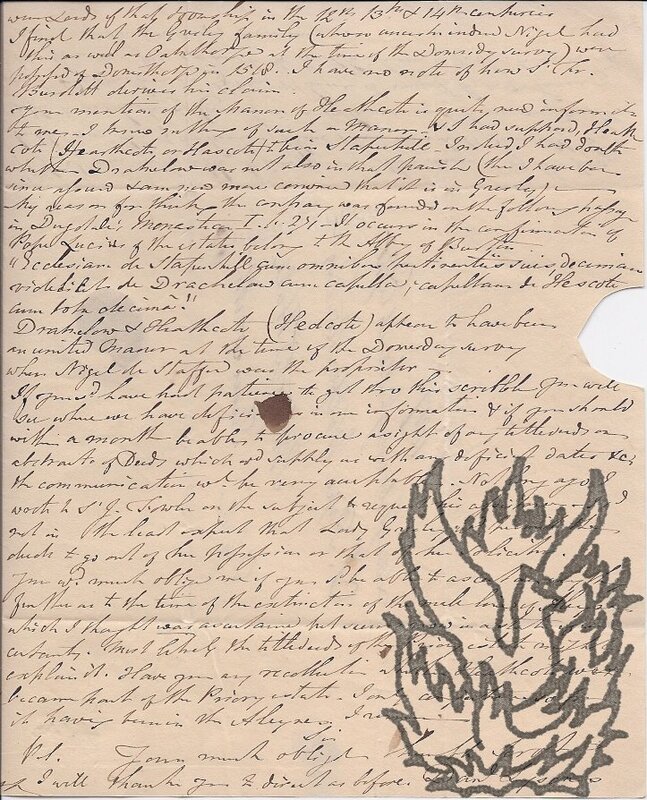 On letterhead of Winster Hall, Derbyshire. 18 July 1878. 2pp., 12mo. In good condition, lightly aged. He writes that he is 'much obliged, and gratified, by the expression of approval of my "Half Hours" in your kind note received this day', for which he thanks him. [Mason Pottery [later Mason, Cash & Co. Ltd], Church Gresley, Derbyshire.] 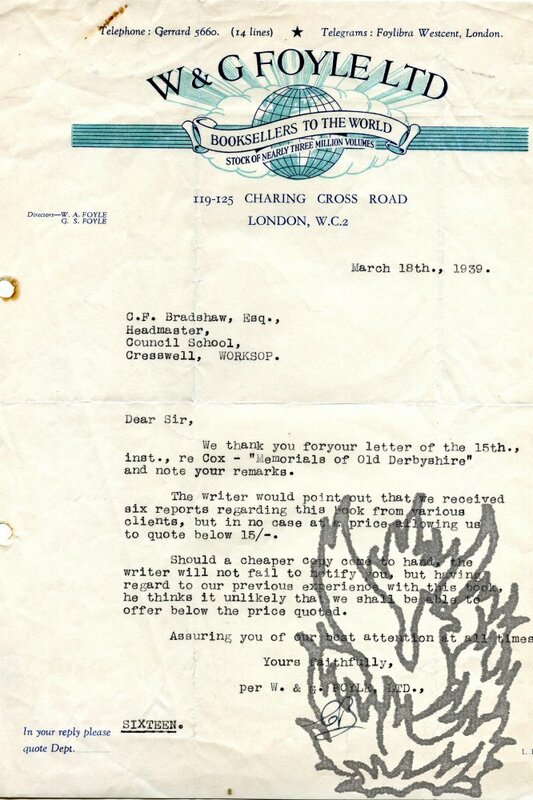 Informations and Complaints of Joseph Walker Bourne, proprietor of the pottery, against an apprentice and a 'handler', signed by Sir Oswald Mosley, his son, Bourne and others. County of Derby [Derbyshire]. 27 October and 1 November 1830. 2pp., 8vo. In fair condition, on lightly aged and worn paper, with slight damage to one corner. At the head of the first page is a printed form (manuscript additions in square brackets): 'County of [Derby.] 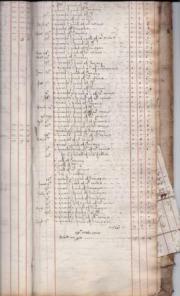 The Information and Complaint of [Joseph Walker Bourne] of [Church Gresley] in the said County [Potter] taken upon Oath before [me one] of his Majesty's Justices of the Peace for the said County, the [27th] day of [October] 18'. Written out by the magistrate Sir Oswald Mosley, 2nd Baronet (1785-1871), and signed by him ('Oswald Mosley'), his son 'Oswd Mosley Junr' (1804-1856), 'Joseph. [Sir Joseph Paxton.] 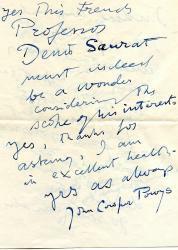 Autograph Letter Signed ('Joseph Paxton') to 'Mr. Smith', regarding the financing of a project, with reference to Sir Joshua Walmesley and 'the liberal party'. Chatsworth [Derbyshire]. 6 September 1848. 4pp., 12mo. Bifolium. In very good condition, on lightly-aged paper. The letter begins: 'My dear Sir, | Having a day to spare, and having a little business in London, I left home by midnight mail yesterday, but unfortunately got into the smash that took place on the North Western line [i.e. Autograph Letter Signed ('W. Howitt') from the English author William Howett [to the editor of the Literary Gazette William Jerdan? ], requesting a favourable review [of his 'Popular History of Priestcraft']. 1p., 16mo. On aged paper, with minor damage on removal from album. He requests 'the favour of an early notice in your journal, of the accompanying little volume if it be fortunate enough to meet your approbation'. The work has 'no object but to serve true religion & true liberty'. In a postscript he requests a 'copy of the paper containing the notice'. Howitt practised as a chemist in Nottingham between 1822 and 1836, when he moved to Esher, Surrey. 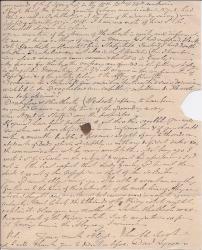 Autograph Letter Signed ('Samuel Prince.') from the Victorian book collector Rev. Samuel Prince [to George Cruikshank], discussing his involvement in the Philological Society's new dictionary (later the Oxford English Dictionary). The Study, Bonsall, near Mattock. 15 September 1857. 3pp., 12mo. Fair, on lightly-aged paper. Addressed to 'Dear Sir', but from the context clearly addressed to Cruikshank. (That Cruikshank and Prince were correspondents is shown by a reference in Rosa Baughan's 'Character Indicated by Handwriting' (1880), which describes a 'long letter' from Cruikshank to Prince.) Prince begins by apologising for not thanking Cruikshank for his 'Exposure of that "Scamp's" devices'. 4to, 4 pp. Bifolium. 105 lines of text. Clear and complete. Good, on lightly-aged paper. Black wax seal with impression of 'D L' adhering to reverse of second leaf, which is postmarked 'LOUGHBOROUGH | 109' and franked '1817 | Loughborough March Eight | S. Pipe Wolferston [sic] Esqr | Stotfold Hall | Tamworth | [signed] P. Gell'. Begins 'I have recd. your obliging communication of the 22d. Typed Letter, signed by 'C B', 'per W. & G. Foyle, Ltd, to C. F. Bradshaw, headmaster of the Council School at Cresswell, Worksop, Derbyshire. 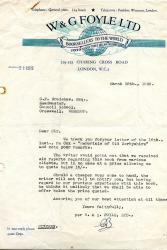 18 March 1939; on 'W & G FOYLE LTD' letterhead. 4to, 1 p. Good, on lightly aged and creased paper with minor rust stain from paperclip at head. Letterhead, in light and dark blue, featuring globe and the mottos 'BOOKSELLERS TO THE WORLD' and 'STOCK OF NEARLY THREE MILLION VOLUMES'. Thirteen lines of text. Bradshaw is clearly unhappy at the price asked for a copy of Cox's 'Memorials of Old Derbyshire'. 'The writer would point out that we received six reports regarding this book from various clients, but in no case at a price allowing us to quote below 15/-. Three Autograph Letters Signed (all 'Osbert') to 'My dear James' [the film producer R. J. Minney]. 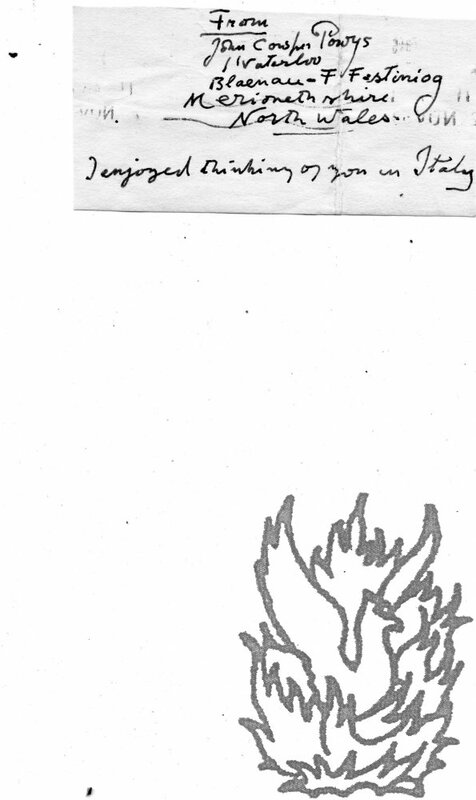 Letter One: 'Friday Renishaw' [c.1942]; on letterhead of 2 Carlyle Square, SW3. Letter Two: 5 April [c.1942?]. 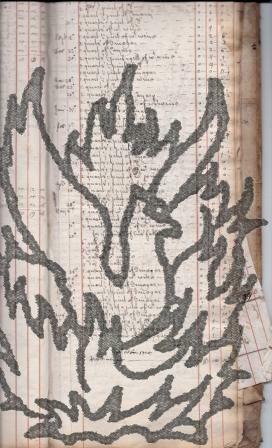 On illustrated letterhead of 'Renishaw Hall, Derbyshire [last word deleted]'. 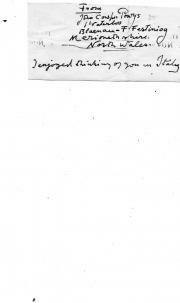 Letter Three: 4 January 1944; on Renishaw Hall letterhead. Sitwell and Renishaw collaborated on the play 'Gentle Caesar' (published in 1942), and the last two letters would appear to concern a possible film adaptation. All three items very good on lightly aged paper. Letter One ('Friday Renishaw'): 12mo, 2 pp. 18 lines of text. Apparently written around the time of the play's composition. Sitwell is 'delighted' that Minney is 'already immersed in Pares's book. 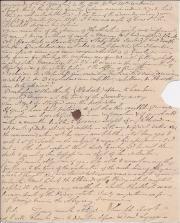 I have just read the Czar and Empress Marie's Letters.' He has 'marked (in the preface mostly) what I thought helpful for atmosphere, or amusing'. Autograph Letter Signed to 'Mr Disspain'. 8 November 1958. 1 Waterloo, Blaenau-FFestiniog, Merionethshire, North Wales. 8vo, 4 pp. Bifolium. Very good on lightly aged paper. Written in Powys's distinctive, sprawling hand. Concerns William Blake and the monograph on him (1954) by Denis Saurat, who 'must indeed be a wonder considering the scope of his interests.' 'Yes I was brought up by my mother on the Poems of Blake; so I am always interested by any reference to them or any reproduction of them. Indeed and indeed I can fully understand your being so hypnotized by the pictures of Blake that you find yourself going to see them when you had decided to go somewhere else'. Powys is 'in excellent health'. 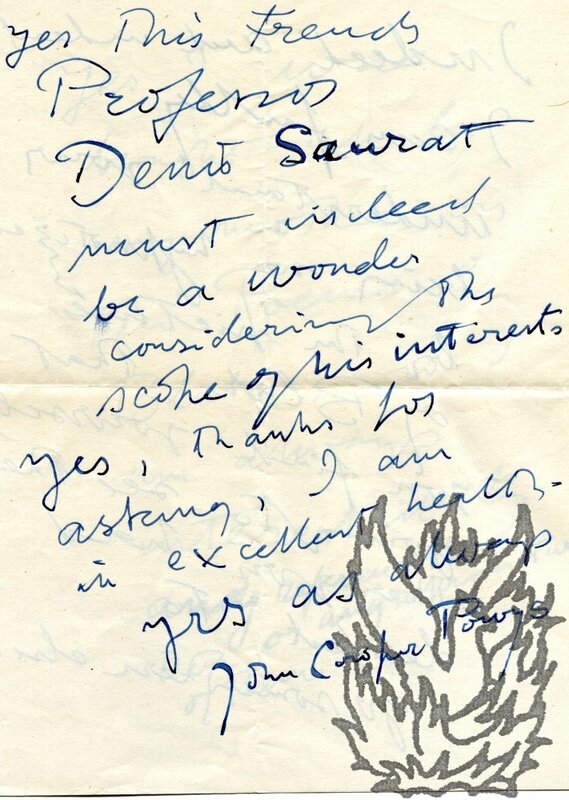 Autograph Letter Signed ('Osbert') to 'My dear James'. Monday' [no date]; on illustrated letterhead of Renishaw Hall, Derbyshire (amended by Sitwell to 'Renishaw | N[ear]. Sheffield').